According to the American Society of Plastic Surgeons, face lifts are one of the most popular forms of plastic surgery to reverse the visible signs of aging in both men and women. In the medical world, a face lift is technically known as a rhytidectomy, and under the hands of a good plastic surgeon, it could make you look up to 10 years younger! So it’s not surprising that so many age conscious people have this particular procedure at the top of their cosmetic surgery wish list. The primary aim of a face lift is not actually to remove wrinkles, as many people seem to think, although this will occur to some extent as a side effect of the procedure. 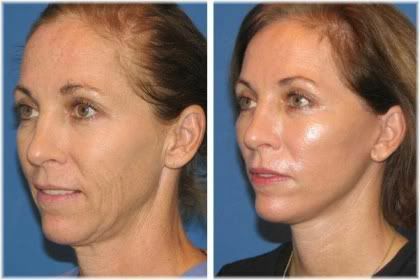 The main goal of a facelift is to lift skin which is lax, or sagging, around the jowls, jaw line, cheeks or neck area. Providing that things go according to plan, the end result will be smoother, tighter and less wrinkled skin giving your face an overall more youthful and radiant looking appearance. 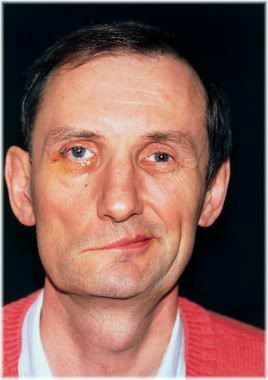 A rhytidectomy may be carried out by itself as a single surgical procedure, or combined with other surgical procedures such as eye lid surgery (blepharoplasty) or brow/forehead lift surgery (browplasty). A facelift may also be combined with non-surgical procedures such as laser skin resurfacing, microdermabrasion or dermal fillers, such as collagen, Restylane or Botox injections, to more visibly reduce the appearance of fine lines and wrinkles. Generally, combined surgical procedures can be carried out simultaneously at reduced cost, although, when combining a surgical and non-surgical procedure, they will usually be carried out separately. 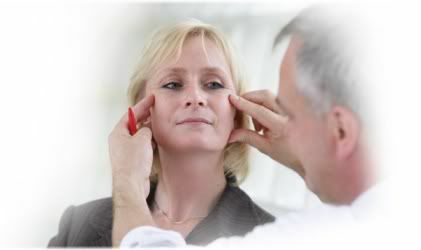 A common misconception about face lift plastic surgery, is that only mature or elderly adults will benefit from it. The reality, however, is that a face lift can be carried out at virtually any age because there are many different types of procedures available. You can, for example, get what is known as a traditional face lift, which is mainly intended for people who have a significant amount of sagging skin throughout the lower facial region. This type of procedure is more suitable for older adults, such as people in their 50s or 60s, but if you only have localized regions of sagging, such as around the jaw or neck line, then you can get what is known as a “mini facelift” to just target those problems areas. Contrary to popular belief, you don’t need to wait until middle age to have your face lifted, as there are now many different types of procedures which are suitable for all age groups. This latter procedure is mainly intended for younger adults aged between 30-50, so regardless of how much facial sagging you have, age isn’t really a concern unless you are deemed to be too young or too old to undergo surgery. If you are thinking of having a face lifting procedure done, it is therefore important to know what your options are as you may or may not require a full face lift. Different procedures can be used to address different regions of the face. To carry out a traditional face lift, your surgeon will start by making an incision within the temple hairline and then extending that incision down the side of the face, still within the hairline, until he reaches the skin that sits in front of the ear where your hairline ends and where men sometimes grow sideburns. By keeping the incision within the hairline, the vast majority of the eventual scarring will be naturally hidden by your hair. So you won’t have to worry about a big scar running down your face! The procedure then continues by extending the incision along the front of the ear, around the earlobe, and then up behind the ear into the hairline at the back of your head. The surgeon will try to stay within the natural skin creases and folds as much as possible, so that visible scarring can be kept to an absolute minimum. With the incision that the surgeon has made, they will then be able to surgically separate the skin from the underlying connective tissue, fat and muscle. 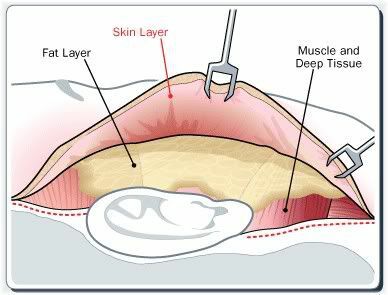 Once the incisions have been made, the surgeon can then start to separate the skin from the underlying fat and muscle layer. Once this has been done, the surgeon will tighten the skin by pulling it backwards at a slight upwards angle until the loose skin has been tightened to the surgeon’s satisfaction and the excess skin removed. If your facelift involves operating on the neck, the skin on your neck will be lifted down to just above your collarbone and across your entire neck. 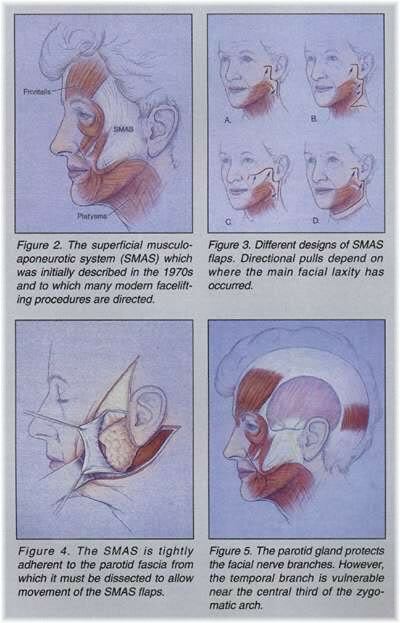 To make your facelift last longer, some surgeons will also tighten a deeper layer underneath the skin known as the superficial musculoaponeurotic plane (SMAP) if you are having a superficial musculoaponeurotic system (SMAS) face lift procedure done. 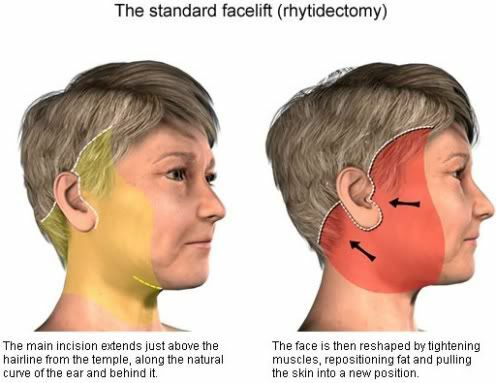 How this is carried out will vary from surgeon to surgeon, although the ultimate goal is to tighten the muscles of the neck and the connective tissue of the cheek. You can get a rough idea as to the type of result that you can expect from a traditional facelift, by placing two fingers just in front of your ear, with the top of your fingers roughly level with the middle of your ear, and then pulling the skin backwards at a slight upwards angle. This will also help you to determine whether or not you would actually benefit from having a face lift done. You can get a rough idea of whether you would benefit from a facelift by gently pulling your facial skin back with your hands. The procedure ends when the surgeon sutures up the incision and then bandages you up for recovery. Face lifts are carried out under general anesthesia, so thankfully, you won’t be awake during the operation! The operation itself generally takes between two to four hours to complete depending on the amount of work that needs to be done and you will usually require an overnight stay in hospital. A traditional facelift can take 2-4 hours to complete, and will usually require an overnight stay in hospital. 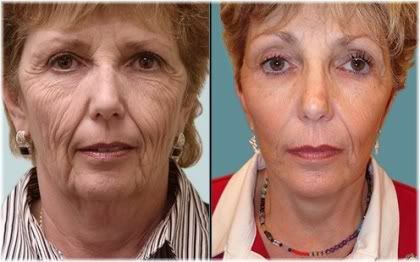 The key to performing a good facelift is to tighten the skin just enough so that it doesn’t sag, but is still loose enough to look natural. If the skin is pulled too tightly, then this may interfere with your normal facial expressions and could even alter the overall appearance of your face to the extent where it becomes obvious that you have had a face lift done. The key to a good facelift is to tighten the skin no more than necessary, as over-tightening can result in the face taking on an abnormal looking appearance. A regular face lift tends to be only needed for people with lots of sagging skin, and is the most invasive of all facelift procedures with the longest recovery time and the greatest financial cost. However, depending on your age and the condition of your skin, you might not actually require your whole face to be lifted. You don’t have to have surgery on your whole face if you don’t need it, as minor facelift procedures can be used to address only your problem areas. If you are relatively young, such as in your 30s or early 40s, you may only need a minor facelift that addresses localized problem areas to give your whole face a slightly younger and fresher looking appearance than what it currently has. Besides being a lot cheaper than a standard facelift, minor face lift procedures take less time for the surgeon to perform, have a quicker and less painful recovery and also leave less scarring. A mini facelift, sometimes called a “weekend facelift”, is most suitable for people who do not require a full facelift and are relatively young with only minor skin sagging around the jaw line or cheek areas. 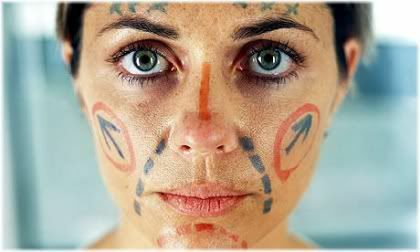 A mini facelift can also be appropriate if you have had a facelift done before, but now your skin is starting to sag and needs tightening up again. At this point, it is worth mentioning that facelifts don’t last forever, as typically, the results you get will last you up to 10 years depending on the type of procedure that you have done. Because a mini face lift involves less work around the neck area, rarely involves any muscle work, and uses smaller incisions that don’t go very far above the ears, the results you get from this procedure won’t be as drastic as you would get from a traditional face lift. 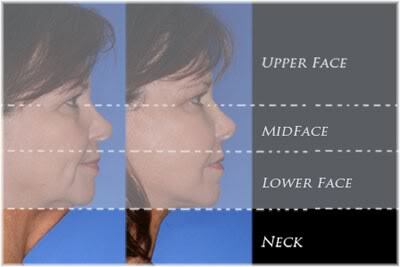 A mini facelift can produce a subtle yet noticeable lift of the lower face region. A mini facelift should therefore be seen more as a way to subtlety enhance the appearance of your face, rather than to make any dramatic changes to it. This is why it tends to only be suitable for younger faces. To minimize scarring, your surgeon may choose to perform an endoscopic facelift, sometimes called a scarless face lift. This involves the use of a small wire-like device that contains a camera to allow the surgeon to see underneath the skin. An endoscopic face lift works best with patients who still have good skin elasticity, as a lack of elasticity in the skin is unlikely to produce satisfactory results. The scarring left behind from a mini facelift won’t be very noticeable, as the incision will be made along the hairline and in the natural crease of the inner ear. But even if you don’t have an endoscopic face lift, the eventual scarring that you get will be barely visible from a mini face lift because the surgeon will only make an incision along the temple hairline down to the earlobe. 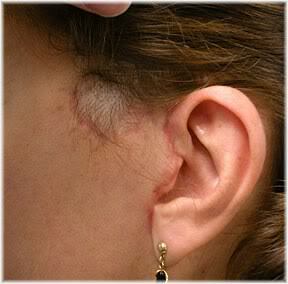 As a result, your scars will be hidden by your hair and disguised within the skin crease of the ear. 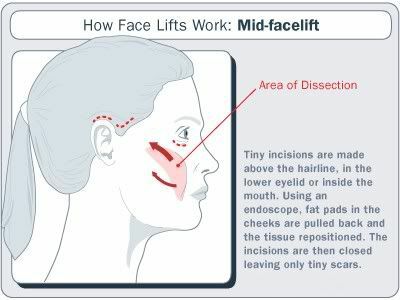 An S-lift, or short scar facelift, gets its name from the type of incision that is made during the face lifting procedure. 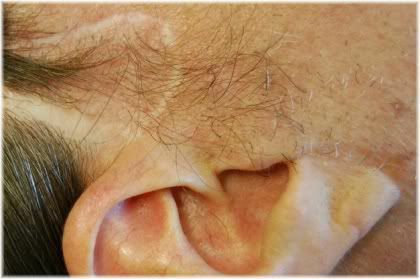 An S-shaped incision is made starting in the hairline just above the ear, which is then extended downwards along the ear and around the earlobe before being extended upwards slightly behind the back of the ear if a greater lifting effect is required. One of the main advantages of an S-lift is that it can be carried out much quicker than a regular facelift, typically in about a third of the time, and also tends to avoid overtightening the skin thereby producing a much more natural looking end result. 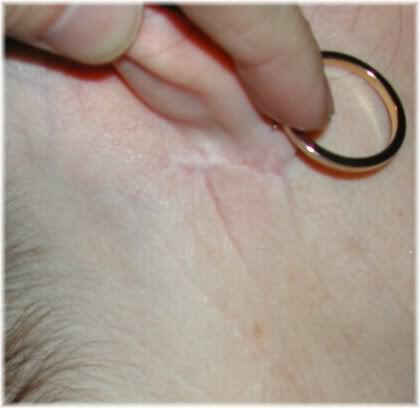 Furthermore, due to the smaller size of the incision, there will be less visible scarring after surgery. 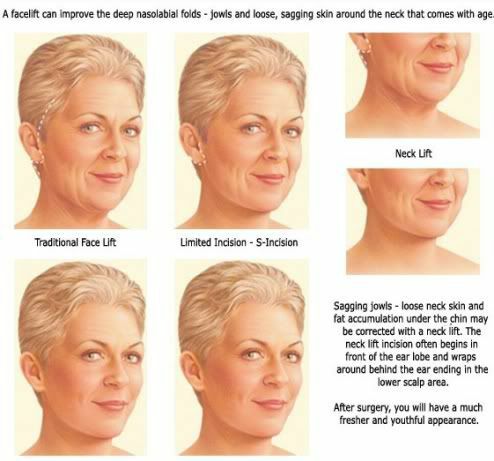 An S-lift is similar to a mini facelift in the sense that it is more suited for addressing minor facial and neck sagginess as a result of the small incisions that are made. This procedure is also much cheaper than a regular face lift, so if you are quoted the same price for both procedures you may want to consider looking elsewhere. If you mainly have sagging skin in the middle of your face, such as in the cheeks and above the upper lip, then a mid-face lift, sometimes called a cheek lift, may be just what you need. Usually, the incisions will be made in your hairline by your temples, although they can also be made in the lower eyelid skin or within the mouth. 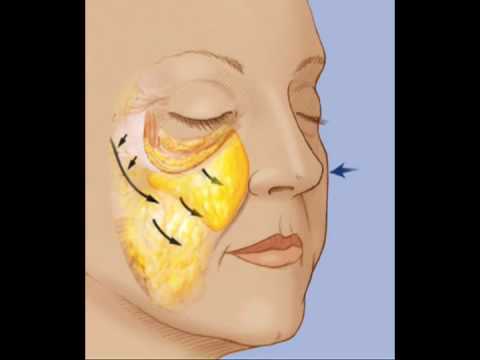 The cheek will then be separated from the underlying cheekbone and then later attached to bone or muscle depending on the surgeon’s preference after repositioning of the malar fat pad has been completed. If done correctly, a mid face lift can produce dramatic looking results. Your cheeks should appear fuller and more youthful and there will be less sag from the lower eyelid region. As an added benefit, you may also notice a reduction in the appearance of the lines that run from the sides of your nose to the corners of your mouth (i.e. the nasolabial folds). The mid face lift targets the central region of the face. This can help to lift your cheeks in addition to improving the appearance of the lower eye region. However, this procedure is not without its risks, as if it is not done correctly, then you may experience sagging in the lower eyelids, injury to muscle nerves causing involuntary facial twitching and prolonged swelling. 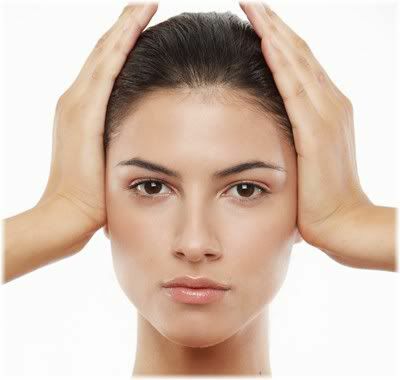 A mini incision facelift is suitable for those who only require minor tightening of the skin. Such facelifts are usually carried out by a dermatologist who has had little surgical experience or training. Typically, the procedure involves microliposuction of excess fat in the neck and an incision under the chin to tighten the neck muscles. A mini incision facelift is best combined with other treatments such as a facial peel or laser skin resurfacing, as the results you get from this type of procedure will be fairly subtle on its own. Face lift surgery tends to be most popular with women, although in recent years the number of men undergoing surgery has been steadily increasing. One of the reasons for this has been the rising levels of obesity in western society, as when people who are obese lose weight, they are likely to have significant facial sagging which causes them to look much older than they are. To address this facial sagging, a face lift may be carried out after a person has lost a lot of weight. If they also have sagging skin in other regions of the body, such as around the abdomen, buttocks, thighs and arms, then separate procedures can also be carried out to tighten and remove their excess loose skin. After losing a lot of weight, patients are often unhappy with the way their skin sags. 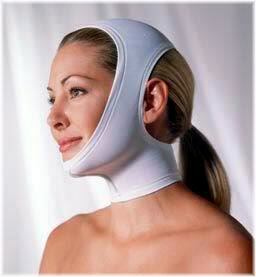 Fortunately, a facelift can quite effectively help to remove and tighten lax skin. However, most plastic surgeons who specialize in body contouring procedures for overweight patients will usually not agree to operate on you immediately, as they will ask you to maintain your current weight for a set amount of time. This is necessary to allow for any more weight loss that may occur, and also to ensure that you are not going to quickly put back on the weight which you have lost. Once your weight has stabilized and your body has had time to adjust, your surgeon will then proceed with the procedure. A face lift after weight loss can be carried out in several ways depending on how much weight you have lost and the resulting laxity of your skin. If you have lost a moderate amount of weight and now have sagging skin on your face and/or neck, then your facelift will most likely be carried out in the standard way with incisions made within the temporal area and behind your ears. As a result, your facelift won’t be very much different from anyone else of regular weight. If, however, you have lost a significant amount of weight, then a slightly different approach may be used by the surgeon. In such cases, an incision will usually be made in front of the hairline, in front of the ears and along the hairline behind the ears. This allows the surgeon far more freedom when operating on you so that more noticeable results can be achieved. You may also have incisions extended along the back of your head where your hairline meets your neck, so that extra skin which is present can be excised, or cut, away. If you are a female, then you will probably be able to hide these scars with your natural hairstyle, although some receding men may find their scars more difficult to conceal. How much a face lift costs can vary greatly depending on the type of procedure that you are having done and the extent of that procedure. You may be able to reduce the cost of your surgery quite substantially if you choose to have plastic surgery done abroad rather than in your home country. Popular destinations for having cosmetic surgery overseas include Asian countries such as Thailand or Eastern European countries such as Poland. More and more people are choosing to have plastic surgery done abroad. For some procedures, this can work out cheaper than having it done at home, and you will also get to enjoy a nice holiday before your surgery! You will have to factor in the cost of travel, food and accommodation in to the overall cost of your surgery, so this may or may not work out to be a cheaper option. 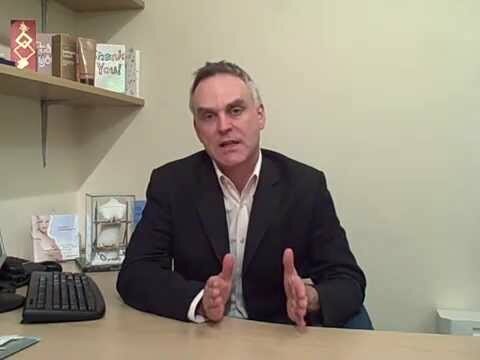 Generally, however, if you are having multiple procedures carried out at once, or a very expensive single procedure, then you can usually achieve some quite substantial savings compared to if you have your surgery done at home. 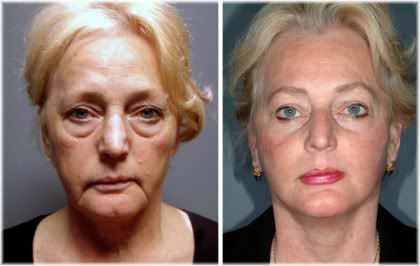 A browlift, sometimes called a forehead lift, is a cosmetic procedure designed to remove excess sagging skin which is causing the forehead or eyebrows to droop. Your surgeon will choose the most appropriate technique based on the extent of lifting that you require. A brow lift is similar to having to face lift, except that only the top portion of the face is operated on. But in principle, the effects are the same; tightening of the skin and a younger looking face. In addition to removing excess skin, a brow lift may also mean removing some of the muscles in your forehead that normally allow you to frown. As a result, your ability to frown will be reduced thereby delaying the appearance of future forehead wrinkles. One of the most effective ways to determine whether or not you would benefit from having a brow lift, is to stand in front of a mirror and pull your forehead up with your fingers positioned at the top of your forehead. If lifting your forehead up allows you to see better, or makes you look happier, relaxed or more youthful, then you would probably benefit from having a brow lift. If lifting up your brow with your hands improves the appearance of the forehead region, or allows you to see better, you would probably benefit from having brow lift surgery. Remember, when lifting up your forehead, your aim should be to raise your eyebrows to a normal height. Do not lift your eyebrows too high, because if your eyebrows were at this level in real life, then you would have a permanent surprised looking facial expression. Another way to determine whether you would benefit from a brow lift, is to ask others whether you look angry or tired all the time. But unless you have very honest friends, you probably won’t get an honest answer, as most people will just be polite and tell you that “you look fine“. 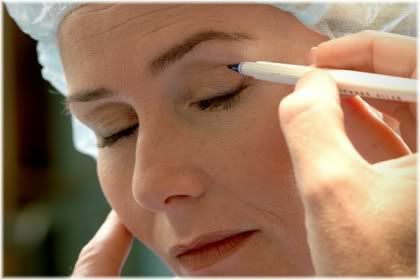 The most common surgical technique used for a brow lift, is the coronal brow lift. This involves making an incision across your scalp so that it is hidden by your hairline. The coronal brow lift gets its name from the coronal incision that’s made at the top of the forehead. 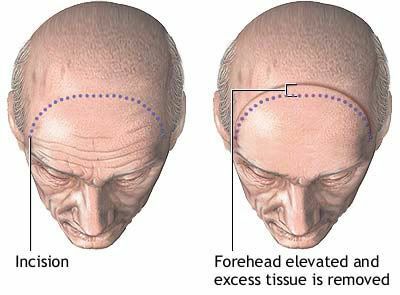 The forehead is then pulled upwards and any excess scalp tissue, in addition to some muscle, is removed. The forehead is then repositioned so that your eyebrows are lifted and your forehead is tightened, after which, the incision is then closed. A coronal brow lift can also be combined with a full face lift, and this is quite easy to do because the surgeon will be able to join your facelift and brow incisions above the ears within your hairline. One of the disadvantages of a coronal brow lift, is that it leaves a longer scar than the brow lift technique we shall describe next. How visible this scar will be really depends on the skill of your surgeon. There is also the possibility of experiencing numbness in the scalp after your procedure, although in most cases, things will eventually return back to normal. 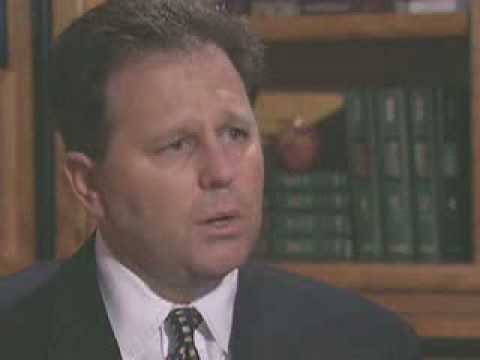 The endoscopic brow lift is a newer technique that involves the use of an endoscope, which is basically a tiny camera that can be inserted underneath the skin. 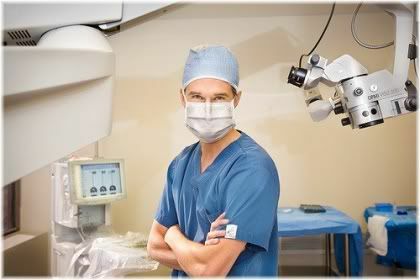 But in order to use an endoscope, a surgeon is required to have specialized training. So not all surgeons may be able to offer this procedure. During an endoscopic brow lift, the surgeon doesn’t actually remove any scalp tissue to lift the forehead. Instead, with the assistance of the endoscope, the surgeon separates the forehead from the scalp tissue and some of the underlying muscle via three to five small incisions along the hairline. The scalp is then pulled upwards and fixed into position with a permanent, dissolvable or removable device. 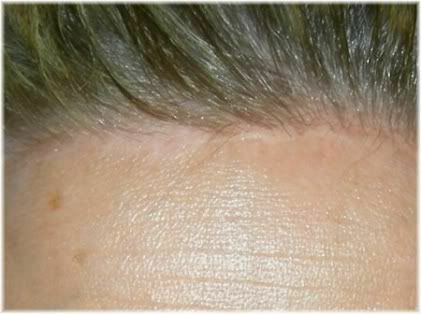 The scarring of the forehead tissues will go down to the bone providing a permanent brow lift. An endoscopic brow lift will leave you with less scarring because only a few small incisions are made along the hairline. Also, because no scalp tissue is removed, you are likely to experience a quicker recovery and suffer from less scalp numbness than you would from a coronal brow lift. The incisions made during an endoscopic brow lift sit close to the hairline, which may result in them being more visible than the scar from a coronal brow lift. The end result may also not last as long, and in some cases, may not appear entirely symmetrical. This means that some parts of the forehead may appear to sit lower or higher than other parts. 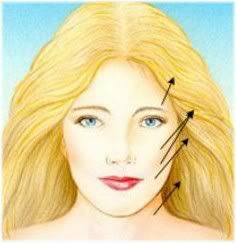 If you have a coronal brow lift, then you will have an incision line than runs across the top of your scalp, which, in some cases, will run from ear to ear. 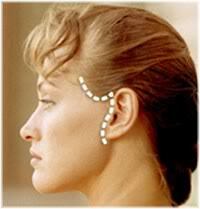 Although this will leave a big scar, most people won’t notice as it will be concealed by your hair. With an endoscopic brow lift, your scars will be smaller and should be virtually invisible when fully healed. Since an endoscopic brow lift is less invasive than a coronal brow lift, you may be able to return back to work after one week, although it is generally recommended to rest for at least two weeks if you can. But with a coronal brow lift, you may not feel like going back to work until two to three weeks after your surgery. When you are fully recovered, your eyebrows will appear higher and your forehead will be tighter, smoother and less wrinkled. Due to the lifting effect on the forehead, your face will regain a more awake and refreshed looking appearance. Depending on your age, you may want to consider having a brow lift done together with a face lift or lower eyelid surgery to give your whole face a more youthful looking appearance. This, however, will increase the cost and recovery time of your surgery. Your eyes communicate to others a lot about your current emotional state. For example, you can often tell if someone is happy, sad or fearful just by looking into their eyes. So it’s not surprising that the eyes are commonly referred to as the “windows to the soul”. As you grow older, your eyelids start to sag and fat deposits accumulate mass which then causes bulging around the skin of your eyes. The effect of this is that your eyes start to look tired and old. You have two sets of eyelids; upper eyelids and lower eyelids. Generally, most people first notice sagging in their upper eyelids, as these are the most vulnerable to gravity. When your upper eyelids start to sag, they appear to hang over the eye, and in some cases, may even start to impede normal vision. 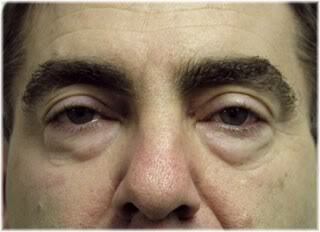 Lower eyelid sagging becomes most noticeable when you are tired, and appears as “bags” underneath the eyes. As you age, you may develop permanent bags under the eyes which subsequently makes you look tired and as though you haven’t had enough sleep. Sagging eyelids make you look old and tired. Fortunately, for those who have sagging upper or lower eyelids cosmetic surgery provides a very viable and effective treatment option, as eyelid surgery can remove the excess sagging skin around the eyes, and by doing so, literally knock years off the appearance of your face. Furthermore, eye-lifts may also be beneficial in helping to reduce the symptoms of migraine by reducing pressure on nerves behind the eyes. 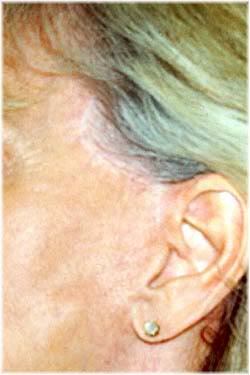 An effect that has also been found to occur with Botox injections. 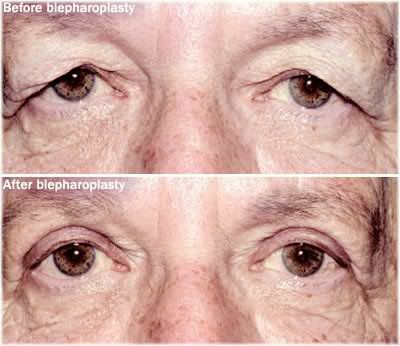 In the medical world, an upper eyelid lift is known as an upper lid blepharoplasty. A cosmetic surgeon will first identify the excess sagging skin, mark the area using a pen and then excise the excess skin in a semi-ellipse shape. Some underlying muscle may also be removed, and if there is excess bulging fat present, then it will be reduced so that the bulging effect no longer occurs. The incision will be made in the normal lid fold and will usually extend to the side of the lid. The incision is then closed with very small sutures, and when you have fully healed you will be left with a barely noticeable scar. When you have fully healed, your eyes will appear more open and your ability to see may also be improved. If you are of Asian or Oriental descent, the shape of your eyes will be different from caucasian lids. As you don’t have a very pronounced upper eyelid crease, you may decide to have a “western fold” by undergoing eyelid surgery. Some people choose to have a western looking fold created purely for cosmetic reasons, even if they don’t really require eyelid surgery. 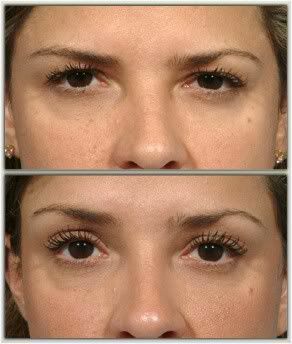 If you don’t want to have a western fold, eyelid surgery will be carried out in the normal way. 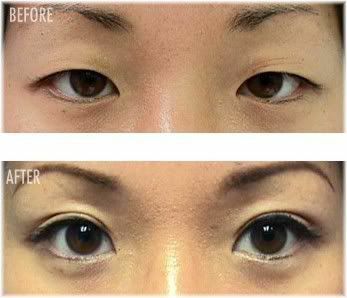 Oriental eyelid surgery can be carried out to make oriental eyes look more western. However, it is extremely important that if you are of Asian or Oriental descent, that you make sure that your surgeon has operated on Oriental or Asian eyelids before. The reason for this is that your eyelids are slightly more difficult to operate on, and therefore, require a greater degree of skill from the surgeon. One common complaint that people with sagging lower eyelids have, is that they keep being told by others that they look tired and that they should get some sleep. 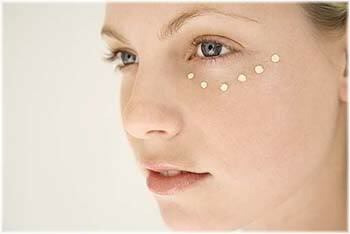 When your lower eyelids start to sag, they also become puffy due to fat deposits under the skin. Later, they may also start to develop wrinkles aswell. All of these factors contribute to making you look sleepy, tired and old, which is why some people choose to undergo lower eyelid surgery. 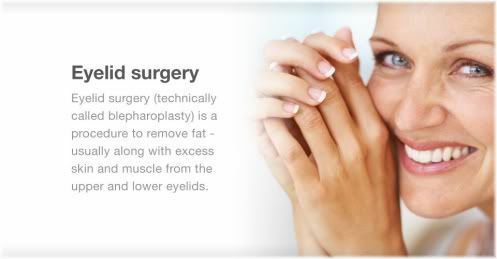 There are two main approaches, as described below, used by plastic surgeons to reduce fat deposits, also called “fat pads”, from the lower eyelids. What method a surgeon chooses to use largely comes down to their personal preference. A small incision is made through the skin and muscle directly below the eyelash. The fat pads are then exposed and reduced. Excess skin is removed, the incision is closed and will eventually heal without leaving any visible scar. In this approach, the fat from the lower eyelids is removed via an incision made on the inside of the eyelid. If all you require is excess fat removal, then this incision may be all that you need. If, however, you require excess skin removal, then you will also need to have an external excision as well. There is a third approach to lower eyelid surgery, but it isn’t as commonly used as the previous two approaches. Some cosmetic surgeons believe that more natural looking results can be obtained not by removing fat from the lower eyelids, but rather, by rearranging that fat around the eyes. However, this approach tends to be less suitable for those with lots of excess sagging skin. So it’s mainly used on younger patients with minor complaints. If all you have are small wrinkles around the eyes and you are not affected by bulging or sagging skin, then you probably won’t require or benefit from eyelid surgery. Instead, a better option would be lower eyelid skin resurfacing with a chemical peel or with laser skin resurfacing. 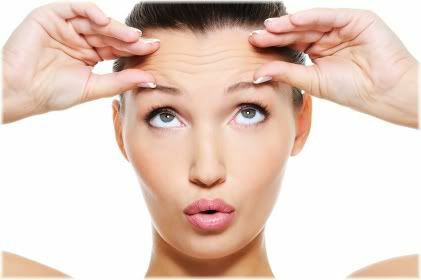 If your only concern is to get rid of wrinkles, a skin resurfacing treatment may be all that you need. Sometimes, eyelid skin resurfacing is done together with eyelid surgery if there are noticeable wrinkles around the eyes. So if this is something that you are concerned about, mention it to your surgeon as they may be able to help. Immediately after your operation has been completed, you will most likely have drainage tubes running on either side of the face for one or two days. The purpose of these drainage tubes are to remove excess blood and fluid so that they don’t pool under the skin and cause swelling. This is important as otherwise a hematoma or edema could develop that causes an uncomfortable pressure on the face. Your head and face will then be wrapped in surgical dressing, after which, you will be sent to the recovery room. When you wake up after your facelift, your face is likely to feel tender, swollen and sore. It may be too painful to move your mouth to chew solid food for the first few days, so you can expect to eat mainly liquid foods for at least 3-4 days post surgery. Although a facelift can at times be quite a long and complicated procedure, it may surprise you to learn that most people tend to recover quite quickly and are usually back to work in 2-3 weeks. Of course, you will not have made a 100% recovery in this short time period, but you should be feeling well enough to start resuming your normal everyday activities. Typically, it can take many more months, sometimes even up to a year, for your swelling to go down completely and for your scars to heal fully. If you have never had a facelift before, the new symptoms and sensations that you will experience can take you by surprise. So it’s worth taking the time to familiarize yourself about some of the things that could happen, as this way you’ll be better able to prepare yourself for them and deal with them if and when they occur. The best way to do this is to speak with your facelift surgeon during your consultation period, although it can also be helpful if you can speak with past facelift patients as they will be able to give you a firsthand account of exactly what they went through. 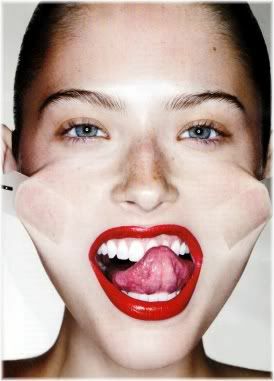 Most people though, will react to a facelift differently in terms of the physical and mental symptoms they experience. But in general, you can expect your face to feel tight, numb and uncomfortable in places which is perfectly normal after having a major invasive surgical procedure carried out on your face. If however, you find yourself in intense pain, have developed a high-grade fever or your wounds look infected, then you should report these symptoms to your surgeon as soon as possible because something may be wrong. In the large majority of cases, if such symptoms are dealt with promptly then the risk of them progressing into something more serious can be greatly reduced. In terms of emotional symptoms, most facelift patients tend to feel depressed for the first few days after their surgery. This may be due to their appearance after surgery which they must wait to heal, the discomfort that they are in, or simply due to the fact that they are alone and must spend time by themselves recovering. It’s normal to feel nervous before having any type of surgery. It is also normal to feel some degree of nervousness, apprehension or anxiety about how your facelift is going to look, as it won’t be until 2-3 weeks later that will you be able to judge how successful your procedure was, and most importantly, whether or not you like the end result. Some patients also have concerns as to what other people will think of them, in particular, whether their friends and family will like, or accept, their new look. 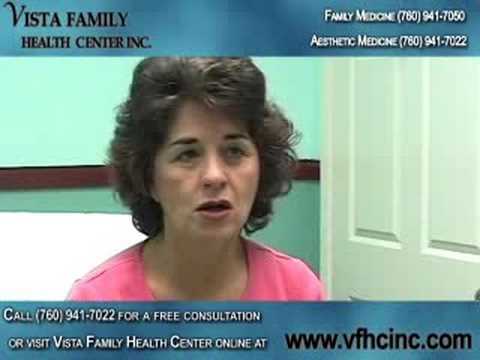 This can be quite a significant concern if you are having a full facelift procedure, because in some people, the results can be quite drastic making them visibly look many years younger than they previously did. So this will take some time for other people, and yourself, to get used to. A common concern that all patients have about any form of plastic surgery, is how much pain they will be in once their procedure has been completed. When it comes to facelift surgery, how much pain you will be in largely depends on the extent of your procedure. How much pain you are in after surgery largely depends on the extent of your procedure. 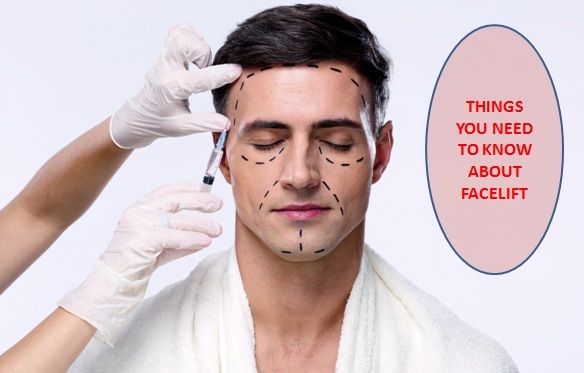 If, for example, you are having a mini-facelift, then you should make quite a speedy recovery and so the amount of pain that you will be in shouldn’t be too bad. If, however, you have a full face lift that targets the lower, middle and upper regions of the face, then obviously you can expect to be in more pain as more of your face has been operated on. But regardless of the type of procedure that you have, it is natural to experience some amount of pain following your surgery. Specifically, you can expect heaviness, swelling, soreness and increased sensitivity or tenderness in the areas that the surgeon has operated on. You are also likely to feel some tightness in the face and neck regions, and may not be able to turn your neck from side to side fully during the first couple of days after surgery. If you had a cheek lift done, then your ability to see may be impaired somewhat until your swelling goes down. The good news, however, is that most of the pain can be controlled with pain medication. So you are likely to experience more discomfort than intense physical pain. Although, it would be a mistake to think that you will be pain-free post surgery, as even pain killers won’t necessarily make your pain disappear entirely. They will just make it easier to manage and live with. You can quickly develop a tolerance to painkillers if they are overused. When this occurs, you will need stronger medication to relieve your pain. In terms of the duration of your pain, for minor procedures that target localized regions of the face, the majority of your pain will be over within 1-2 days. For more complex and invasive procedures, this duration can be extended an additional 5-6 days. But your pain will always be greatest immediately after your surgery. Pain can also be reduced somewhat with anti-inflammatory medication. Patients who undergo invasive procedures such as breast augmentation, rhinoplasty, abdominoplasty and thigh lift surgery, tend to almost always express concern regarding the eventual scarring that will be left behind from the incisions made on their body. Patients undergoing facelift surgery are no different. Unfortunately, it’s not possible to give a concrete answer as to how one’s scars will turn out. 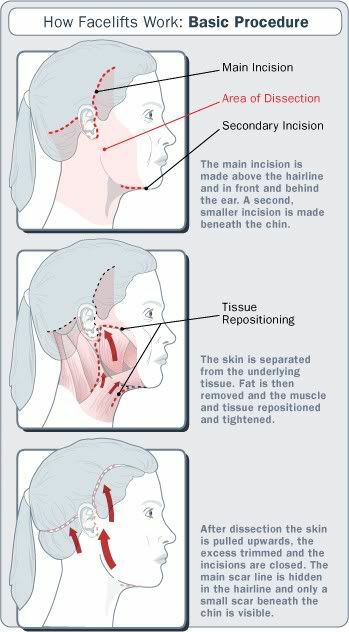 This is because different surgeons may use different techniques, for example, a standard incision vs. an endoscopic incision vs. a microliposuction incision, which may be placed in different areas of the face depending on what the patient is trying to correct. Some people heal very well from their incisions and have thin light scarring, whilst others may develop thicker scars that are darker in appearance. Post surgical care of one’s wounds also plays a significant role in scar formation, and a surgeon cannot predict how well their patient will tend to their wounds. 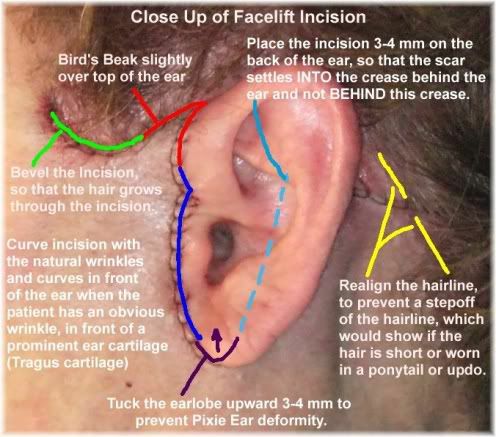 So as a very rough guideline, you can expect your incisions to start just above the ear within the hairline following it down past the front of the ear and then curving around the earlobe and going back upward towards the hairline on the back of the head behind the ear. Initially, your incision marks will be very visible and the resulting scars can take anywhere from 4 to 6 months to fully heal to the point where they fade from a purplish color to a whitish skin color. Once your scars have fully healed, they should be barely noticeable and most likely will be fully concealed by your hair. There is a risk, however, of hair loss occurring along the incision line which could then make it more difficult for you to conceal that scar with the surrounding hair. For the first two weeks after having cosmetic facial surgery, it is important that you avoid any strenuous activities and this includes exercise. It is generally recommended to take things easy, but that you allow yourself to do the things which you feel capable of doing. Doing some amount of daily physical activity, even if that just involves walking around for a few minutes, will help to promote healthy blood circulation within the body and reduce your risk of developing a deep vein thrombosis (DVT) which could potentially lead to very serious post surgical complications, one of which, is death via a pulmonary embolism. The risk of this happening though, is extremely low, providing you’re not lying down without movement for the whole day. If you have had a full facelift performed, you may not be able to drive for the first week as your neck movements are likely to impaired as well as your sight from swelling. 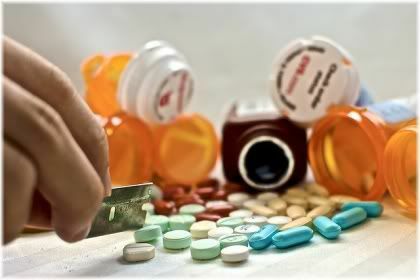 The pain medication that you are taking can also cause you to feel weak or tired at times, so you shouldn’t be doing anything that poses a risk of injury until you are free from the influence of your drugs and mental clarity has been restored. In terms of what you can eat after your surgery, you can eat anything you feel able to eat. Although, for the first few days this will probably be limited to liquid based foods, such as soups or fruit smoothies, as chewing food too soon after your operation can cause your wounds to become more tender and sore. All of this, of course, depends on the type of procedure you have. 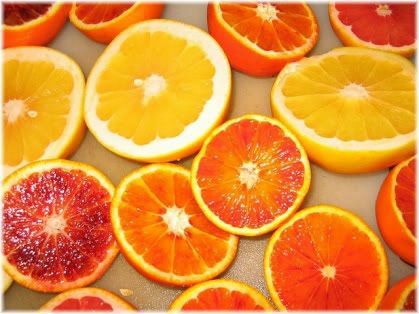 Eating vitamin C rich foods during your recovery can help to speed up the healing process. Your overall aim though, should be to focus on eating healthy natural foods that are high in vitamins, minerals and protein, as this will greatly help to assist the healing process. In particular, vitamin C and zinc can be beneficial for wound healing. Alcohol should be avoided for the first week, as alcohol can increase the risk of postoperative bleeding. It will take about 2-3 months for your swelling to go down fully, although for some people, it may take up to a year. So you won’t be able to judge your results properly until all your swelling has gone down. The scars take a little longer to heal, typically taking 4-6 months to fade from a dark color to a light color, but some people may take 9-18 months to see their scars fade. You may have to wait up to one year before you’ll be able to fully judge your results. Providing that you choose your cosmetic surgeon carefully, you should end up with good results and look younger than you did before surgery. But because it can take such a long time to fully recover from a facelift, by the time you do recover, you may have forgotten what you used to look like which can make your results seem less impressive than they actually are. As a result, you may want to take a photograph of your face before your surgery, and then take another under similar conditions once you have fully healed. This will allow you to see the full results of your surgery, and accurately judge how much your face has actually changed. Even though thousands of people undergo facelift surgery safely and successfully each year, a face lift is still a major surgical procedure, which means that there are risks involved with having one done. The good news, however, is that most of these risks can be avoided providing that you research your surgeon properly and then are honest with them about your current state of health. Ideally, you want a surgeon who specializes in facelifts and performs them on a regular basis. It is important that you find a surgeon who has experience performing facelifts, and ideally, also specializes in the area of cosmetic facial surgery performing facelifts, and possibly other facial procedures, regularly each week or month. Some surgeons who do not perform facelifts on a regular basis may be inexperienced or out of practice, and so you are unlikely to get the best results from them. When you find a potential face lift surgeon, always ask to see before and after photos so that you can assess the quality of their work. 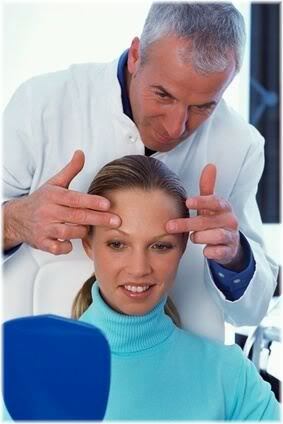 If possible, also speak with past patients of that surgeon so that you can see the surgeon’s results up close. 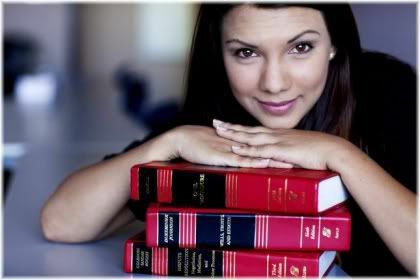 Be honest with your surgeon about preexisting medical conditions, as these can influence the safety of your procedure. Being honest about your current state of health is vitally important in not only reducing the risks of facelift surgery, but also in ensuring that you get the best possible results. If you have any current medical conditions, psychological disorders or are taking drugs for anything, then make sure that you inform your surgeon about them. Certain medical conditions and drugs can cause complications during or after surgery, which in some cases, can be life threatening. Other factors, such as alcohol abuse, recreational drug use and smoking can all affect your ability to heal, and therefore, also affect the end results that you are likely to get. 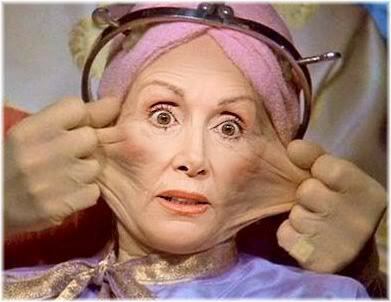 Don’t rush into a facelift not knowing anything about it. Spend the time to research it first, and you will greatly reduce your risk of something going awry. 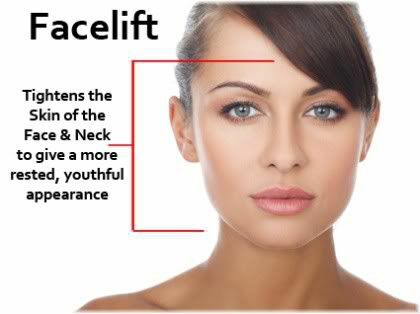 Facelift surgery is a serious procedure and so you should take your time to research it thoroughly. This webpage should help you a lot in that regard, but also look elsewhere as there are many other great sites with excellent info on what you can expect to happen on the big day. Remember, the more time you spend researching the procedure you want to have done, the better informed you will be about it, and so the better choices you will make when it comes to how your facelift is carried out and who you choose to do it for you. Below you will find listed some of the main risks that are associated with face lift plastic surgery. Your surgeon should inform you about these risks prior to your surgery, so that you are fully aware of what could happen. Stay away from any plastic surgeon who does not tell you about the risks of face lift surgery or tries to downplay the risks, as they are probably more concerned with your money than your safety or your results. One of the most common risks following facelift surgery is excessive bleeding. This can lead to bruising of the skin, or in more serious cases, a hematoma (swelling under the skin) which may then require another operation to correct. Generally, small hematomas are more common than large hematomas, and most of these can be suctioned out with a needle (surgical syringe). This, however, can delay the healing process. Excessive bleeding can also occur during surgery, and the risk of this happening can be increased if you have a blood clotting disorder (e.g. haemophilia) or are taking blood thinning medication (e.g. asprin). The risk of infection from facelift surgery is greatest after your surgery during the healing process. Your risk can, for example, be increased if you do not receive proper aftercare, if you do not clean or disinfect your wounds, or if you fail to take your antibiotic medication. There is also a risk of infection occurring with synthetic facial implants if the implant has not been properly sterilized. If an implant does become contaminated, it will need to be removed and replaced. Improper healing or separation of wounds can leave behind very noticeable scars. 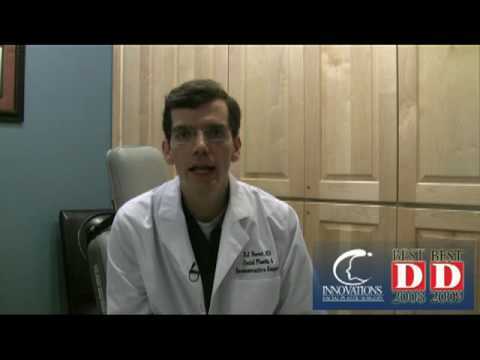 There are two main types of wounding healing problems that can occur after face lift surgery. The first is that the incisions the surgeon has made do not heal properly, or heal slowly, which eventually leaves a much more noticeable scar. The second problem, which tends to be most common in smokers, is that parts of the face do not receive adequate blood circulation which then causes the skin to die and slough off (i.e tissue necrosis). Your incisions may heal better with scar massage therapy, so be sure to ask your surgeon about this. 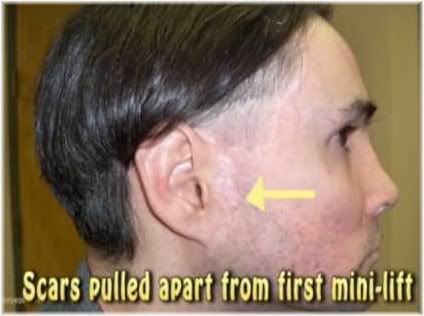 Facial paralysis on right side of face. If any of your facial nerves are damaged during surgery, then you may later experience partial facial paralysis or involuntary facial twitching. An experienced facial cosmetic surgeon will be aware of where these nerves are and so will be able to avoid them. Some people naturally have asymmetrical faces, and so each half of their face looks slightly different from the other. Asymmetry can also occur after face lift surgery if one side of the face is tightened more or pulled differently than the other. Fortunately, asymmetry can be corrected with a revision facelift surgery, but this will obviously come at extra time and expense to you. Although some of the risks of face lift surgery can be very off-putting, it is important to remember that the likelihood of these complications occurring is minimal providing that you are in the hands of a well-trained and experienced facial plastic surgeon. So don’t let these risks put you off getting your facelift, but just be aware that they exist and make sure to speak with your surgeon should you have any specific concerns regarding your operation.